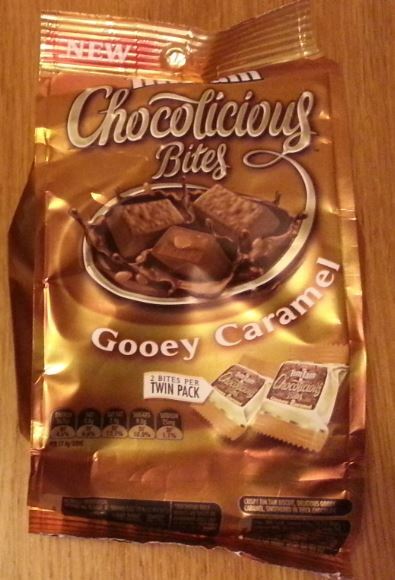 Having looked at the Dark Chocolate variant of this new line a few weeks ago, I thought it was time to turn my attention to one of the others in the range- in this case the ‘gooey caramel’ version. Now, as you may recall my previous encounters with caramel Tim Tams has not been all that successful in large part because what was gooey caramel was falsely advertised as ‘chewy’. I’m glad to say that Arnott’s have clearly been reading my blog, as this new range casts no illusions – we are told up-front that the caramel is going to be gooey. But just how gooey will it be? Well, as it happens, not especially gooey. 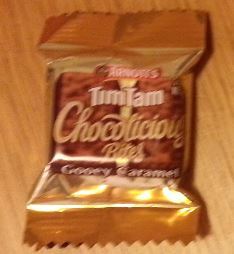 Yes, it is gooey, but I’d say no more gooey than in the aforementioned Tim Tams. In fact, these biscuits taste pretty much identical to the regular Chewy Caramel Tim Tams – which I take as an admission that Arnott’s got it very wrong with the whole ‘chewy’ thing. Overall, then, quite pleasant, but nowhere close to the sophistication and decadence of their Dark Chocolate brethren. Yes, the packaging might be fancy, but these are pretty much common-or-garden caramel biscuits wearing a posh frock. Which makes the whole thing a bit of a disappointment, really. It just seems that Arnott’s have a bit of a blind spot with caramel biscuits. I’m going to give these a five out of ten. This book was given to me recently by a colleague. As he gave it to me, he mentioned that it was his favourite book – which is always a bit of a worry, in case it turns out to be terrible. That worry was even more acute in this case, as the colleague in question is actually my boss. I read most of it on a couple of long plane journeys, and it passed the time very satisfactorily. It documents the machinations and manoeuvres of the British and Russian empires in the central Asian region from the late 1700’s to the start of the First World War. Throughout that entire period, the British and the Russians never engaged directly, but moved to occupy and then cede various areas of what is now Afghanistan, Turkmenistan, Kazakhstan and other neighbouring central Asian states. In the process, of course, various Khanates, kingdoms and city states were variously sacked or occupied, puppet regimes were installed, and various promises and treaties were made and broken. The primary concern of the British was to protect India from hordes of Russian troops funnelling down the various passes across the Karakorams and into what was the ‘jewel of the empire’. The Russians, for their part, were keen to extend their influence eastwards to gain riches from the trade routes from the east, and find ways around the virtual monopoly the British had on the sea trade routes. 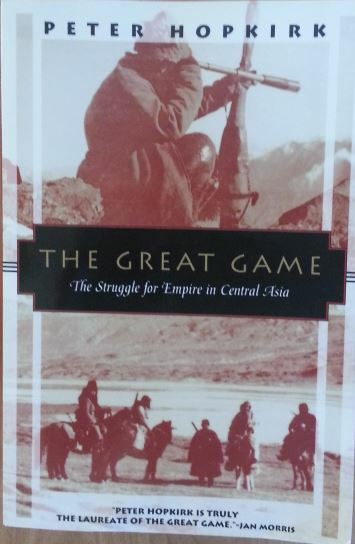 The story is a fascinating one, and in so many ways sounds very contemporary, with ‘hawks’ pushing for ever more intervention in the region, whilst others called for ‘masterly inactivity’; relying on the difficult terrain and puppet ‘buffer states’ to maintain the status quo. It’s also a story of considerable heroism, with individual explorers undertaking journeys of extraordinary hardship in order to return maps and intelligence to their superiors. Disguises, deceptions and canny negotiation with local chiefs were necessary to survive in this hostile environment – all whilst battling some of the most extreme geography on earth. Balancing the heroism is sheer ineptitude. Huge but ill-equipped armies setting out at the wrong time of year, only to perish in the bitter winter snow. Bungled negotiations with local chiefs that result in months or years of degrading imprisonment. And the constant misreading of the enemy’s intentions leading to yet more misadventures. The scale of operations in the region was staggering. Parties would set out with tens of thousands of troops, thousands and thousands of camels and horses (including such delicious details as two camels dedicated to carrying nothing except cigars for the senior officers, and another four pack horses to bring the brandy) and a multitude of camp aides. Enormous quantities of gold and fine gifts would be carried, to bribe local tribes and pay off populations as necessary. And huge artillery pieces would be literally dragged over the highest mountain passes in the world, with men marching for weeks or months before reaching their intended quarry. Forming a backdrop to all of this military activity were the local tribes. Hard, canny people all to often used as pawns in this Great Game – and yet again and again gradually driving out their occupiers in an endless war of attrition and shifting allegiances. The nature – and ultimate futility – of the current operations in Afghanistan are brought into sharp relief when reading this history. Global powers have been attempting to impose control on this region for over two hundred years – and yet the situation today seems little changed from the mid 1840s, with endless attacks on British forces by local tribesmen unhappy with the regime installed by the Empire. Peter Hopkirk’s writing style is natural and the book flows along nicely – the narrative is often quite gripping, and Hopkirk follows individual stories and people as a way of bringing the story to life. This is not a dry and dusty history book. The one thing I wish the book did have is better maps. My knowledge of the geography of this region is somewhat hazy, and whilst there are some rough maps I struggled sometimes to place where the various pieces of the jigsaw lay. Reading on the plane meant, of course, that I did not have the internet nor an atlas to refer to, which would have solved that problem. Still, it would have been nice to have some plates showing not just the contemporary borders and states, but also the modern day borders, to help with context. 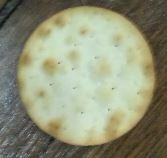 Along with the Sao, the water cracker is probably the most ubiquitous cheesy biscuit in the world. Small, thin, round and crunchy they can be found in every ‘biscuit for cheese’ selection. Interestingly for such a commoditised biscuit, they are made by several different brands, all of which are available in the supermarket. I, of course, eschewed these imitators and purchased the Arnott’s variety. There’s not a huge amount to say about them, really. Their roots lie, as everyone knows, in the hard tack baked to survive long sea journeys in the 1700 and 1800s – made with just flour and water to maximise longevity. Their modern descendants are much more refined, containing other ingredients and fats, and having a shelf-live of only a few months. These biscuits deliver exactly what you expect – a plain, crunchy biscuit. They work equally well as a base for some cheese or as something to dip into an, erm, dip, although they are not ideal for snacking on their own as they are rather dry. Having said that, the kids seem quite happy to chew on them whilst strapped into their car seats. A big part of why I ride my bike is because it’s so convenient. It’s often the quickest way to get around, it’s easier than driving or catching a bus, and I can pretty much guarantee parking right outside my destination. 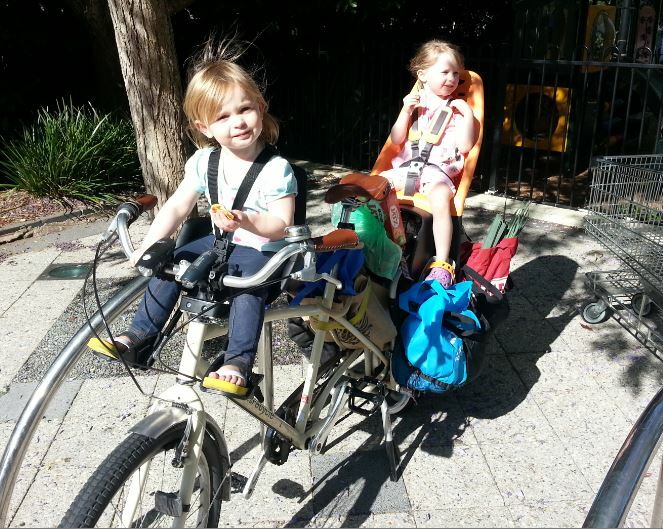 I’ve written several times about my cargo bike, and how it opens up a range of new possibilities for bicycle usage. It was brought home to me again the other day, when I needed to do the weekly shop, visit the library – oh, and I was also in sole charge of two toddlers. I guess to many people the car would be the only option, but we all jumped on the bike, and pedalled away. It was quicker setting up than getting them strapped into the car, an I could chat to them better as we went along. The actual journey (about 2-3 km) was certainly no slower then driving, and when I got to the shops I could lock up the bike right outside, rather than having to drive around and around a subterranean car-park, and then shepherd two small children to a lift. (That whole ‘parking the car’ thing just takes ages, although strangely it’s time that people rarely seem to factor into their journey when estimating travel times. I guess if you’ve never experienced an alternative you just accept it as part of life). We popped to the library, and then the supermarket for a full week’s shop, including six litres of milk, veges, groceries and cleaning things. Then it was back on the bike home again. For sure, the bike was quite loaded up, but it all fitted on fine. Of course, there are options if you need to haul even more than that. 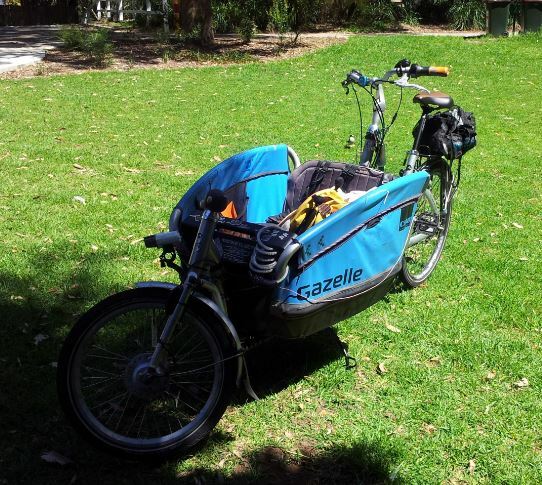 Mrs Chillikebab spotted this bike at a park recently and took a picture – it’s a Gazelle Cabby, and yes, I do want one! Some people, however, seem unprepared to accept the inherent inconvenience that driving entails, and so selfishly impose additional inconvenience on others as the price of their transport choice. 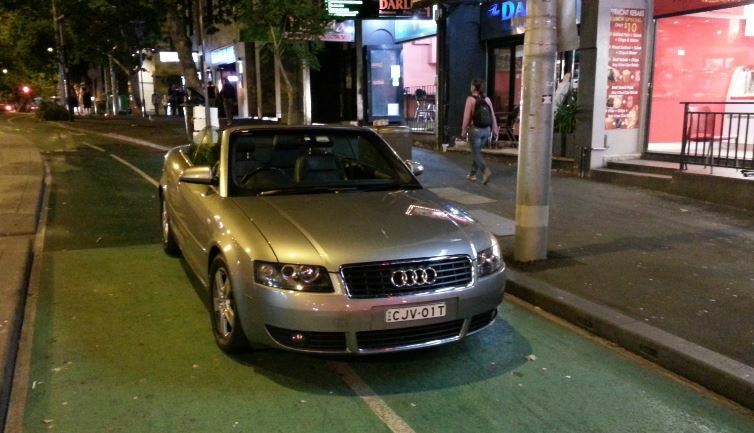 People like the driver of this Audi, CJV01T. Clearly driving along the bike lane in order to park in front of the kebab shop is perfectly acceptable, despite the problems it causes for passing cyclists. I might suggest to the driver that in future he rides a bike – this way he can experience all of the convenience of door-to-door transportation, but without having to negatively impact others.